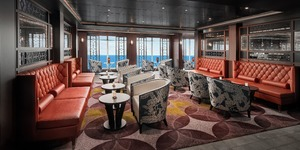 (9:15 a.m. EDT) -- Images released today reveal brand-new venues, including a new-to-the-line sushi bar, updated public spaces and refreshed cabins onboard the renovated Norwegian Sky. The 2,004-passenger ship has emerged from a three-week dry dock in Freeport, Bahamas, as part of the line's $400 million Norwegian Edge refurbishment project. President and chief executive officer of Norwegian Cruise Line, Andy Stuart, said in a statement: "Last year was quite an exciting year with the record-breaking launch of Norwegian Bliss, the announcement of Norwegian Joy’s redeployment to the U.S. and the unveiling of four revitalized ships. 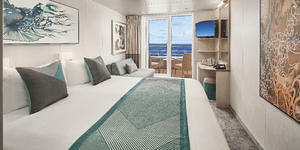 "We are continuing the momentum and starting 2019 with the reintroduction of Norwegian Sky, following a complete refurbishment. She returned home to Miami unveiling new designs and experiences that showcase our dedication to providing guests with quality and meaningful experiences across our fleet." Eight new drinking and dining venues have been introduced, including new-to-the-fleet Pinnacle Lounge and Sushi Bar, which features floor-to-ceiling ocean views. There's also pub-style The Local Bar & Grill; Italian restaurant La Cucina; Sugarcane Mojito Bar; a poolside-venue called Topsiders; Bliss Ultra Lounge; Spinnaker Lounge and Starbucks. 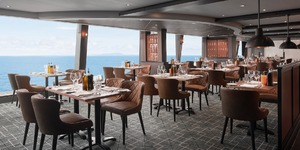 The ship's existing free-dining Palace restaurant, Crossings main dining rooms, Garden Cafe and The Great Outdoors as well as for-fee restaurants Cagney’s and Le Bistro have also received makeovers. All 1,002 cabins have been outfitted with new televisions and USB-ports, with fresh carpets, furniture, artwork, lighting and balcony decking. The 835-sqft Owner's Suite has also received an updated bathroom and private hot tubs. The ship's central Atrium received new flooring and updated reception and shore excursion desks, with new lounge seating added. The pool deck has also received new flooring and furniture, with new canopies and an updated wading area. The all-inclusive ship -- one of two in the fleet to include beverages within the cruise fare -- will continue to sail year-round to the Bahamas out of PortMiami, with some sailings featuring an overnight stay in Havana, Cuba.